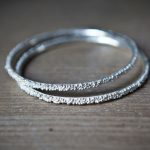 A range of silver and gold handmade bracelets, bangles and cuffs from each of Alice’s collections. 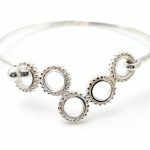 All bracelets and bangles can be made to a specific size if required and can be also be made in 9ct or 18ct gold on request. 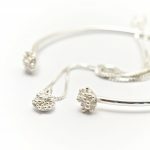 Alice’s jewellery is designed and made in Britain direct from her Sussex garden studio. 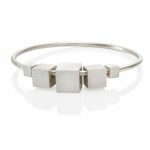 A lovely contemporary bangle with 5 handmade textured hollow cubes. 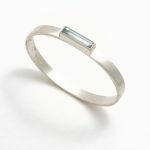 I love the simplicity and movement of this cube bangle! Different variations available on request. 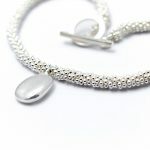 A great silver bracelet made up of hundreds of tiny encrusted beads strung together with a simple silver pebble charm. 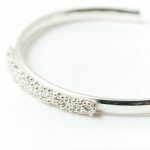 Along with the 'Beaded Ring' version of this bracelet, it's my best seller. It makes a wonderful present that is sure to please anyone who receives it! This bracelet is strung in the traditional way using a strong nylon thread so it will last the time. 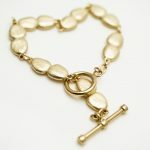 It does means that there is a tiny gap between the beads either side of the clasp where the thread has been knotted. Necklace to match available, see separate entry. 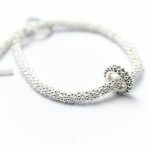 A classic bracelet made up of a continuous row of linked solid silver pebbles. Extremely comfortable and beautifully weighty. 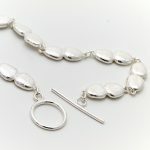 The pebble range is one of my original collections which still out sells all my collections, 10 years on! There's a good reason for that, its simple, tactile and sure to please all ages!